Attorneys. Divorce Law, Real Estate Law and Litigation. Peabody, Massachusetts. Whether your family or business is undergoing a major change, having an attorney is not a luxury, it is a necessity. At Falbo, Solari, and Goldberg, we are dedicated to providing our clients with fair, honest and quality legal representation at a reasonable price. We offer a full range of legal services designed to always keep the best interest of the client as our top priority. With almost 100 years of combined litigation experience, our six-attorney firm has been serving Greater Boston and the North Shore for over 30 years. We are familiar with the local courts and the ever-changing legal landscape in Massachusetts. Our reputation in the courtroom and among our peers, is earned, not purchased. Whenever you, your family or your business has a legal concern, you want to know you have the help of an attorney you can trust. At Falbo, Solari, and Goldberg, we want to be there for you. As a full-service firm, we can help you with a wide variety of legal concerns. At Falbo, Solari, and Goldberg, we are trial lawyers. Our attorneys have each handled hundreds of trials. We represent clients throughout Massachusetts in all courts, including district, probate, administrative, Superior Court and the Appeals Court. If litigation is necessary, make sure you have the help of an attorney who has been there before to help assert your rights. In Massachusetts, title certification is considered an area reserved for licensed attorneys. All real estate work is handled by our attorneys. We have been involved with over 15,000 real estate closings in Massachusetts and New Hampshire. We are familiar with local town governments and have the experience necessary to guide you through any and all municipal approval process on the local and state level. From real estate and business law to divorce and family law, we are ready to represent your best interests and assert your rights quickly and at a reasonable cost. At Falbo, Solari, and Goldberg, we have been helping people just like you for over 30 years. Contact us today for more information. 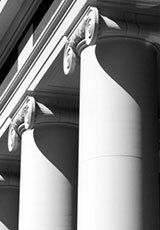 At the Peabody law offices of Falbo, Solari, and Goldberg, we represent clients throughout Massachusetts, including Lynn, Salem, Beverly, Lynnfield, Andover, North Andover, North Reading, Saugus, Danvers, Wakefield, Woburn, Winchester, Malden, Melrose, Chelsea, Revere, Winchester and Essex County, Middlesex County, and the North Shore.